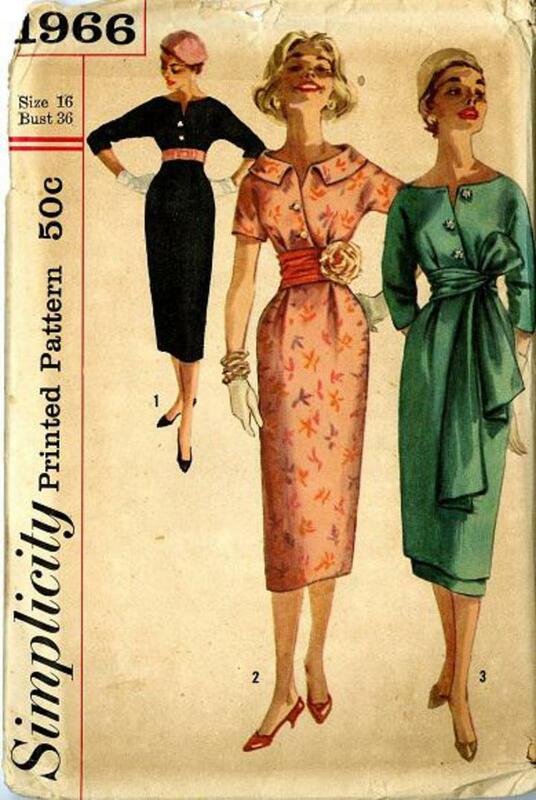 1957 Simplicity #1966 vintage sewing pattern, misses' one-piece dress and tunic with separate sash and cummerbund, plus size 16. Dress all views has empire bodice, sheath skirt, kimono sleeves, low round neckline, button front closing that is open at neck edge. V. 1 has 3/4 sleeves. V. 2 has short sleeves and large collar. Contrast cummerbund is shown. V. 3 shows tunic dress (shorter version of V. 1) with under skirt and self sash. Upper section of under skirt is made of lining, lower section of dress fabric.